யாழ். மாதகல் பிறப்பிடமாகவும், கிரேட்டர் லண்டனில் வசிப்பிடமாகவும் கொண்ட ரமேஷ் லோகேஸ்வரன் பீட்டர் அவர்கள் 04-10-2018 வியாழக்கிழமை அன்று இறைவனடி சேர்ந்தார். 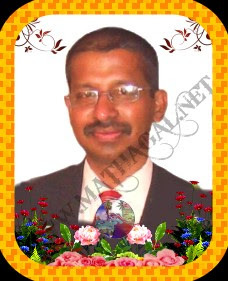 Ramesh Logeswaran Peter was born in Mathagal, Jaffna, lived in Harrow, United Kingdom and passed away on Monday 24th September 2018. He was the beloved son of late Peter Paul and Mrs Emma Manohary Peter. Loving son-in-law of late Dr. Joe Peter and Mrs Clinett Peter. Loving Husband of Miriam Nirany Peter. Loving grandson of late Mr and Mrs John Pillai Bastiyam Pillai and late Mr and Mrs Soosaipillai Martin. Loving Brother of Pragash Peter. Loving Brother-in-law of Krishanthy Pragash. Loving Uncle of Yanoshka and Jerron. Loving Nephew of late Mrs Jeyamony Stanislos, Mr Arulnayagam, Mr Mariyanaygam, Mrs Rajeswary Christy, Mrs Regina Hentry, Mrs Amala Jesudasan, late Mr Emil Manoharan, Mr Maritn Chandran and Mrs Chandra Hentry. Funeral will take place in Jaffna Srilanka.